According to the National Institutes of Health; of the 35 million Americans (as of 2006) age 65 or older, about 2 million suffer from full-blown depression. Another 5 million suffer from less severe forms of the illness. This represents about 20% of the senior population in 2006 -- a significant proportion. It is unlikely that this incident rate is going down and is probably increasing. Depression in the elderly is difficult to diagnose and is frequently untreated. The symptoms may be confused with a medical illness, dementia, or malnutrition due to a poor diet. Many older people will not accept the idea that they have depression and refuse to seek treatment. Depression also worsens during holidays. It is not the actual holiday that causes depression, but the fact that holidays tend to bring memories of earlier, perhaps happier times. 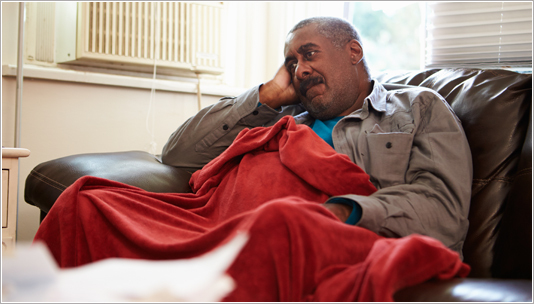 Additional contributing factors that bring on depression may be the loss of a spouse or close friend, or a move from a home to assisted living, or a change with an older person's routine. Depression may also be a sign of a medical problem. Chronic pain or complications of an illness or memory loss can also cause depression. In addition, diet can also be a factor when proper nutrition and vitamins are lacking. As an example, Selma's husband passed away, a few months before Christmas. Her family lived close by and would call or drop in often to check on her. Selma seemed a little preoccupied and tired, but this was to be expected as she had been the caregiver for her husband for many years. It wasn't until the family noticed that her holiday decorations were not out and her yearly routine of Christmas card writing was not happening that they began questioning her mental and physical well being. A trip to her physician confirmed depression, caused by not only the loss of her spouse, but a vitamin B12 deficiency. There were both mental and physical reasons for her depression. "In depression there is a rapid mental decline, but memory of time, date and awareness of the environment remains. Motor skills are slow, but normal in depression. Concern with concentrating and worry about impaired memory may occur. On the other hand, dementia symptoms reveal a slow mental decline with confusion and loss of recognizing familiar locations. Writing, speaking and motor skills are impaired and memory loss is not acknowledged as a being problem by the person suffering dementia." Whether it is depression or dementia, prompt treatment is recommended. A physical exam will help determine if there is a medical cause for depression. A geriatric medical practitioner is skilled in diagnosing depression and illnesses in the elderly. If you are a care taker of an elderly person it may be beneficial for you to seek out a geriatric health care specialist. Older Americans have a suicide rate that is four times the national average. Much of this is a result of depression. As mentioned above, it is estimated that 20% of the aging population suffers from depression. Practitioners not trained in geriatric care automatically assume that depression is a normal part of the aging process. This is not true. Depression can be treated just as effectively in older people as it is in younger people. But sometimes medications are not as effective in older people as they are in a younger population. Unfortunately, practitioners often rely too heavily on medications and don't try other non-medical therapies. Many doctors simply don't choose to recognize depression and help their older patients with it. It is interesting to note that over 70% of elderly suicide victims committed suicide within one month of seeing their health care practitioner. Many of these people were not referred or treated for depression by that health care practitioner. Once the cause of depression is identified, a treatment program can be implemented. Treatment may be as simple as relieving loneliness through visitations, outings and involvement in family activities. In more severe cases antidepressant drugs have been known to improve the quality of life in depressed elderly people. Cognitive therapy sessions with a counselor may also be effective. Join our Council for internet listings of your services and access to hundreds of free articles for your own use. Seniors and caregivers search online everyday for eldercare services and frequently find the National Care Planning Council. Each month, we provide resources to over 40,000 visitors. Our site offers a place for professionals to advertise their services to the public. The National Care Planning Council and its affiliated members are dedicated to helping families recognize the need for long term care planning and to helping implement that planning. A genuine concern for those who are in need of (or may need) long term care are at the heart of our services.